It’s been a tough month. I have to admit it, this hasn’t been my best holiday season. Our first trip with baby Isabelle was a 15 hour flight to Hong Kong. And while I’m not going to complain about two weeks in glamorous Hong Kong or sunny Singapore, coming home was like falling headfirst into a hurricane: house to clean and decorate for the holidays. Jetlagged baby who temporarily forgot how to put herself to sleep. Presents to wrap and cards to write. Overflowing inbox at work. Christmas travel looming just weeks away (why are Thanksgiving and Christmas so close together??). Oh yes, and did I mention my book manuscript was due the week before Christmas? I probably didn’t. Yes, the manuscript for my third (!! )cookbook, details about which I’ll release as soon as I’m allowed. I’ve been working on it spring, summer, fall. Finally, as the submission deadline loomed near in a season full of deadlines, I had to prioritize and cut away the things for which I just didn’t have the time, including this site. So all apologies for not being able to inspire your holiday baking this year, but I hope to make up for it. As I continue getting the hang of this motherhood thing, perhaps I’ll get better at balancing all my responsibilities (or at least be more graceful about acknowledging when a tiny baby has managed to upend my schedule – again). Well, I’m staggering towards the finish line. The manuscript is done, the Christmas tree is up, Isabelle has remembered her perfect sleeping habits – just in time for us to leave town again. Ha. Ha. Well, I do intend to relax this coming week, and finally get to enjoy the holidays with family. And while I’m taking a celebrating a milestone for my manuscript, I’ll finally get a chance to peruse the gigantic pile of cookbooks that Isabelle enjoys toppling over every chance she gets. I love Jessie Moore, the creator of CakeSpy. She is rainbows and unicorns personified, and her first book captured her spirit perfectly. Her second book, The Secret Lives of Baked Goods , is a look at the history behind some of the best-known desserts in the US, is equally charming. As a history buff (I did my fair share of research for my two Field Guide books), this is exactly my my cup of tea. Southern Italian Desserts by Rosetta Costantino – Ok, I did read this cookbook all the way through. The photos are gorgeous and make me miss Italy something fierce, and learning about the regional dessert traditions in Southern Italy was fascinating. I suspect I’ll be re-visiting the sun-dappled pages of this book often in the grey months of the new year. I’m really into breakfast pastries right now, probably because every pastry chef and baker in San Francisco appears to be into breakfast pastries as well. This is probably why I was so drawn to The Model Bakery Cookbook , featuring recipes from this Napa Valley favorite, including their famous English muffins. Although they serve more than just breakfast, their sections on breads and breakfast treats are particularly delightful. Titles don’t get much simpler than Sweet , but the contents are decidedly sumptuous. Valerie Gordon started out making confections, but quickly branched out into all things sweet. This lavish, elegant book is for when you’re in the mood for something unapologetically rich and sweet. Note: I’m delighted it contains a tribute to the famous Blum’s Coffee Cake! Joanne Chang’s first cookbook Flour is one of my personal favorites for its gorgeous design and cozy voice. Her second, companion volume, aptly named Flour, Too , is equally engaging. It covers the savory side of her bakery/cafe, from breakfast through dinner. While there are recipes for cakes and muffins, the majority of the recipes are for sandwiches, salads, and soups, making this a nice choice for households where there’s a cook and a baker – like mine! 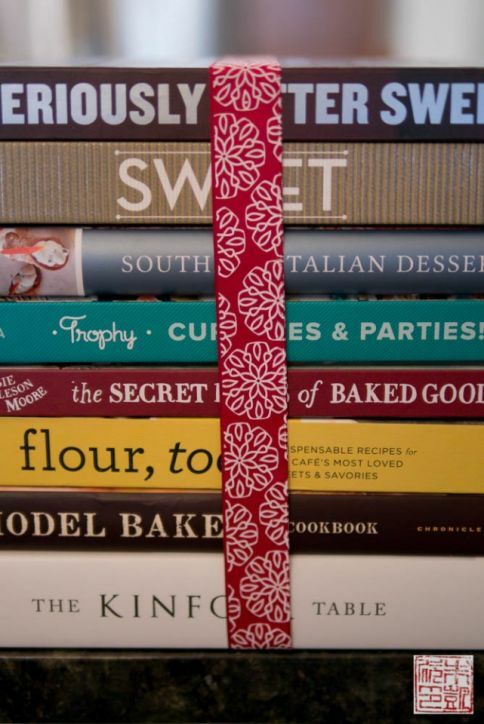 Jennifer Shea’s Trophy Cupcakes and Parties -another cupcake cookbook, you say? Well, when this one is by famous Seattle cupcake bakery Trophy Cupcakes, it definitely stands out from the rest. What I like is that it’s also a party-planning guide, with theme ideas and simple DIY projects to go along with the cupcakes. As a mom with a baby about to turn 1, I will need a lot of party inspiration in the years to come! Best wishes for a warm and happy holidays, dear readers. I promise more updates soon – thanks for your patience! The fact that you are writing your (third) cookbook is seriously amazing and something that I aspire to do. You are so talented, I can’t wait to see what’s in store for 2014. Hope the jet lag is ended and you can enjoy the rest of the holidays!